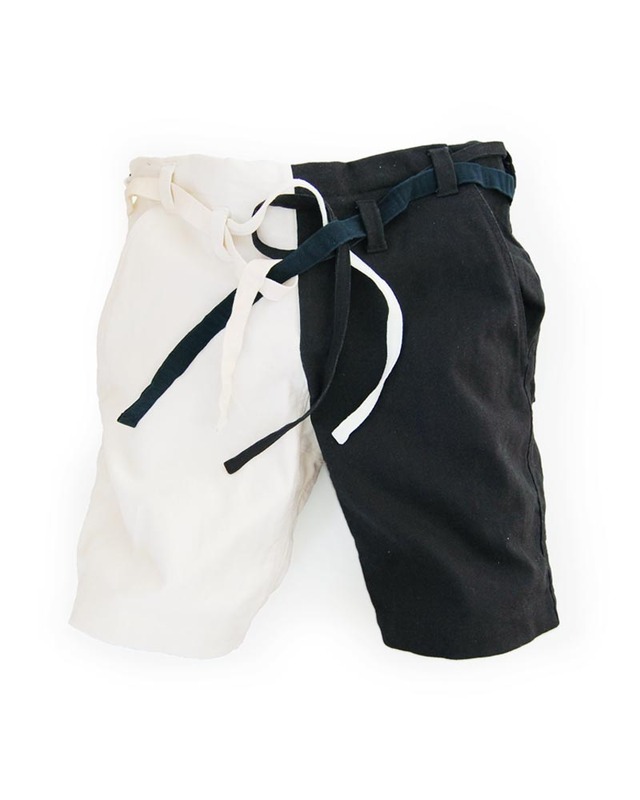 Yoshiyuki’s “Karate Pants” are the brand’s signature pants in which the function of karate-gi and the usability of daily wear are merged in perfect balance. Out of the karate pants series the model #8 is the one with the shortest length. 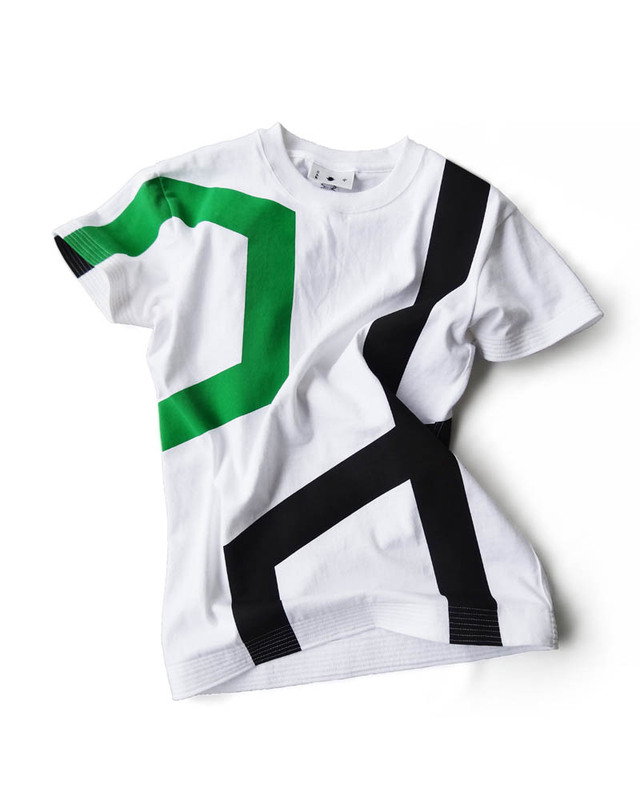 The new color of this model is half and half color consisting of solid black and natural white. 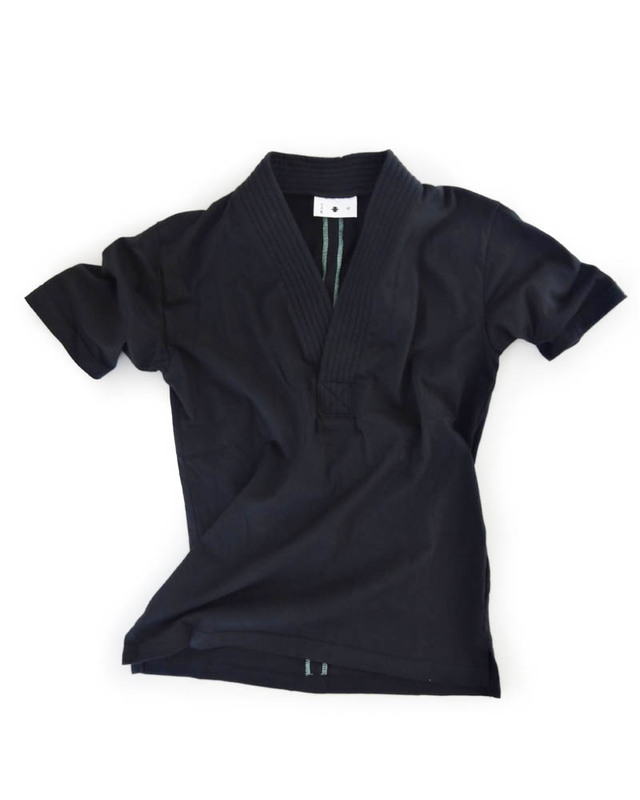 The traditional Sanada-himo straps fixed on the lower waist position are also half black and half white, and such thorough half and half coloring gives a dynamic accent to the overall styling. 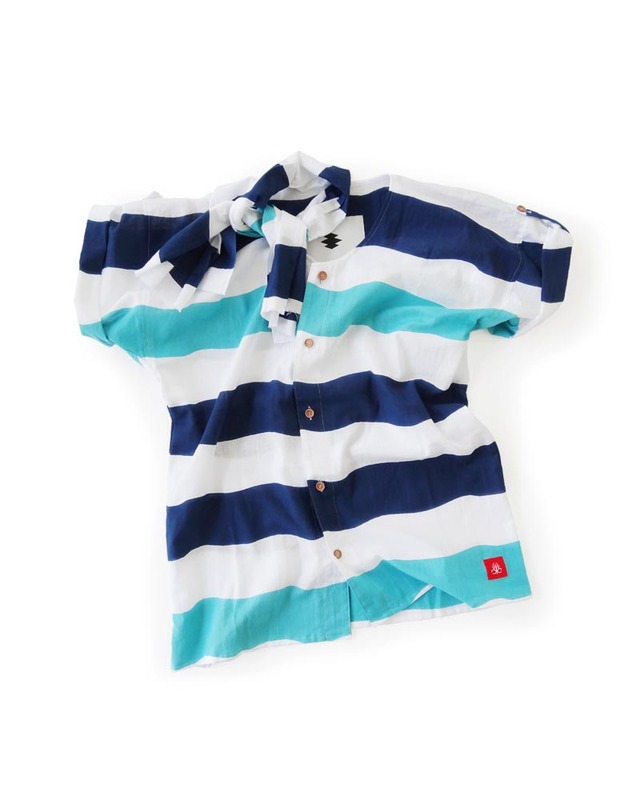 Dry and crisp touch of the cotton-linen mixed fabric will also provide a cool and light feeling to your skin even in the hot summer. 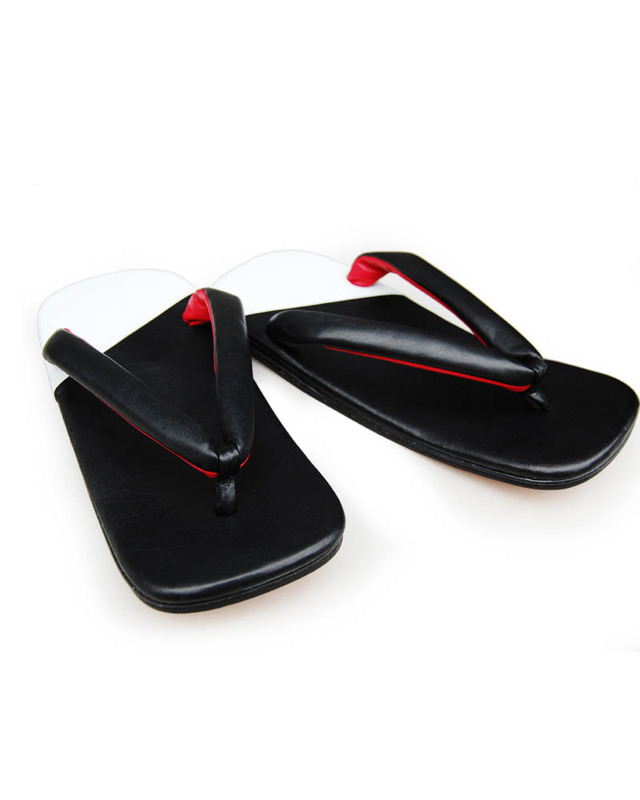 Traditional setta sandals made of fine leather with modern-day switching pattern and collors. 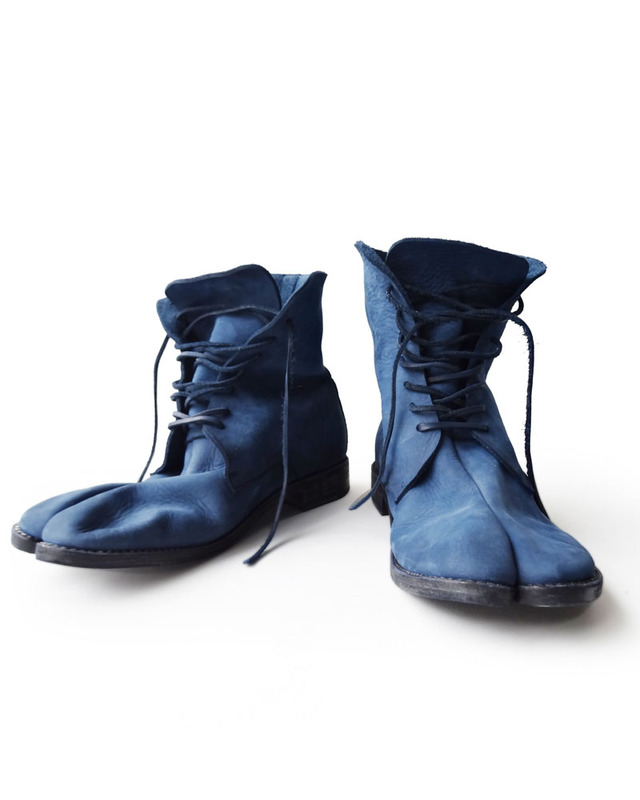 Hand made by skilled craftsmen in Nara prefecture. 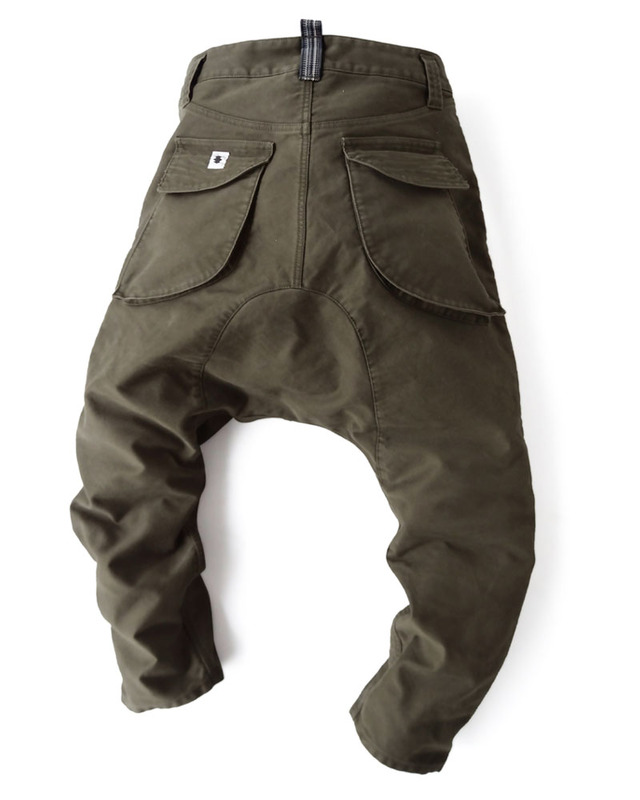 Amphibious pants designed for both beach and town use. 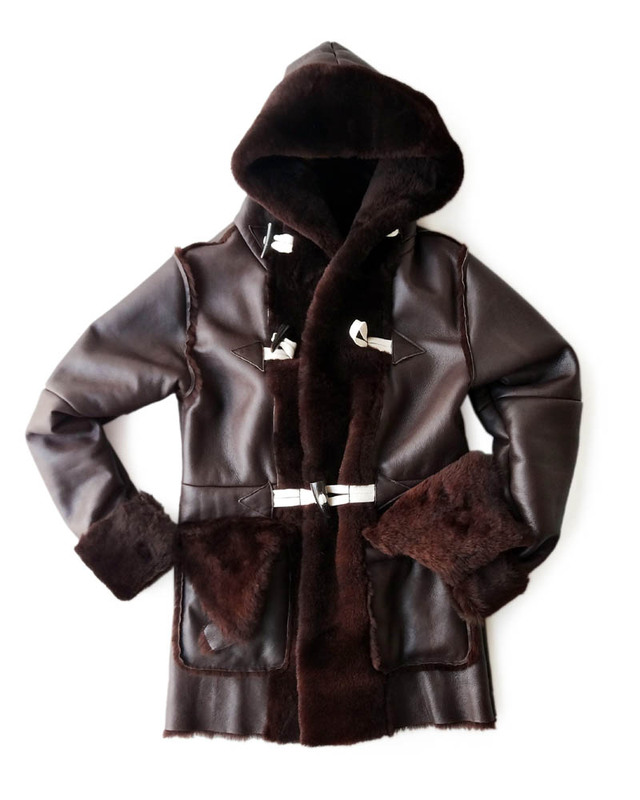 Extended “tortoise shell crest” shape is used as the key design element which makes overall look sharp and masculine. 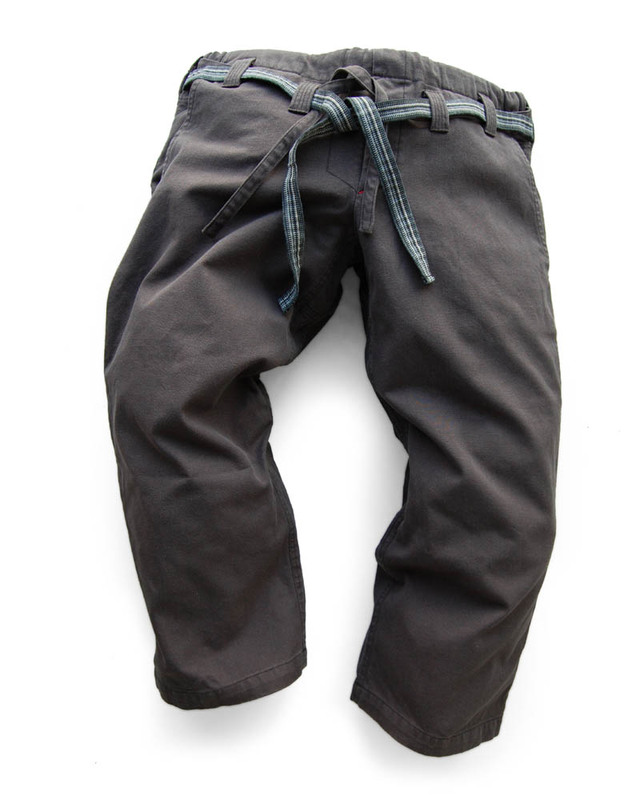 Waist size can be adjusted to fit with the velcro tabs on the sides. This special collaboration project has created the truly new and original “Fish Market Shirt” designed by Yoshiyuki under the production of BLASON. 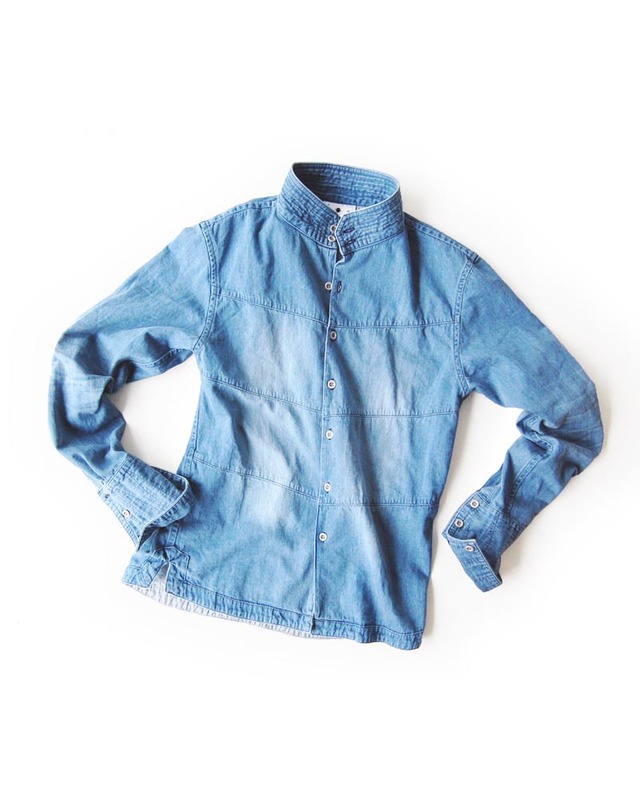 “Fish Market Shirt” is a loose fit Japanese-style collarless shirt which used to be worn by fishermen and fish market people of Tsukiji Fish Market in Tokyo and later became favored as daily clothes especially by the people in the port town, Yaizu, Shizuoka. 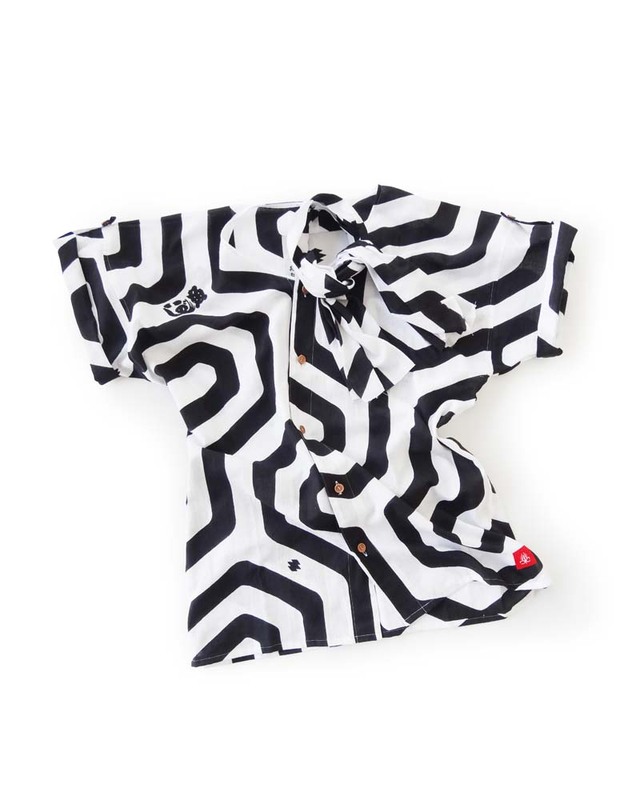 Amongst such locally popular shirts, that have eventually been made nationally popular by Yaizu people, are made of tenugui cloth (a gauze-like cotton fabric), and their patterns are dyed by very Japanese dyeing technique called “chusen”, which literally means “pour dyeing”. 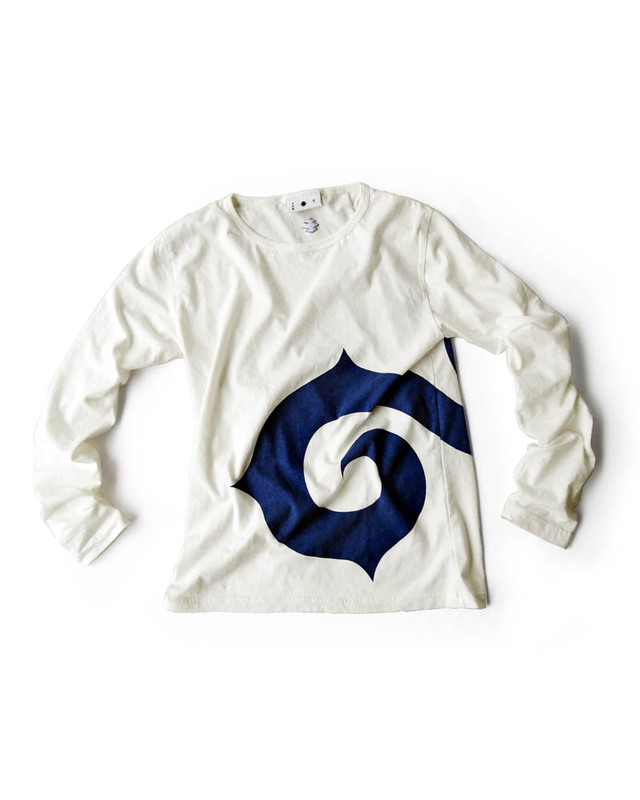 Being made of the fabric of tenugui that is generally used as hand towels, this shirt will become softer and more comfortable as you use it and wash it repeatedly, and will eventually gain more natural and relaxing appearance due to the feature of hand-dyed cotton cloth. Sold in set with the same patterned tenugui. 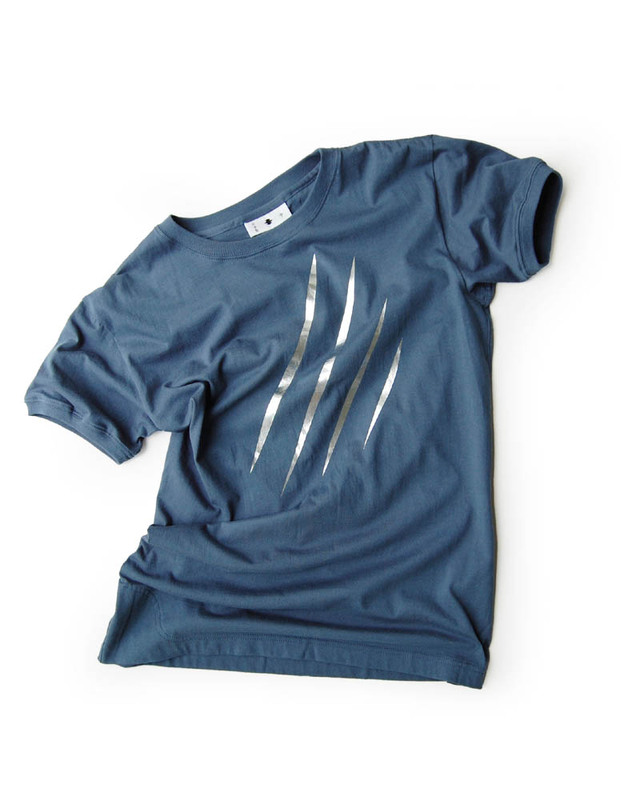 BLASON is an haute couture dress brand whose designer is Konosuke Hattori, who is from Yaizu, Shizuoka. 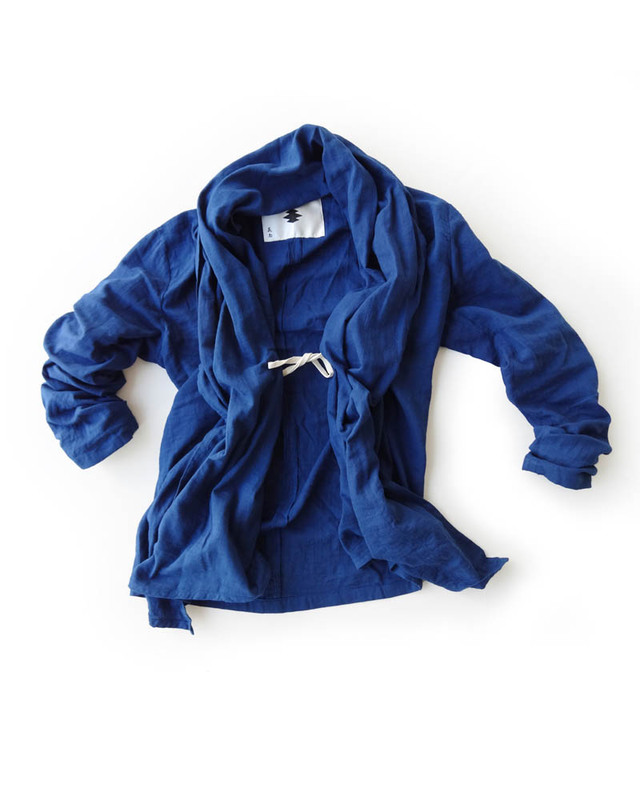 Hattori has been creating his original Fish Market Shirt by pouring his sense of fashion and high skills deeply cultivated by his long carrier of dress making into this very local daily wear under his own label. Out of the elements in “Five Rings” of the esoteric Buddhism thought, the one that signifies change and adaptation is “water”. 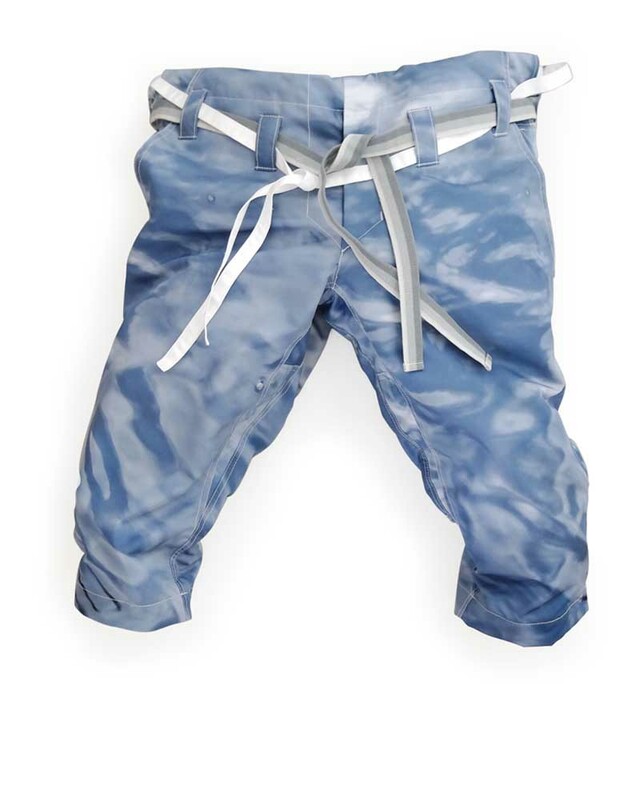 These are the new-type cropped karate pants designed under the theme, “the wearable water”, made of fine silky polyester on which the original photograph of the water surface is printed. 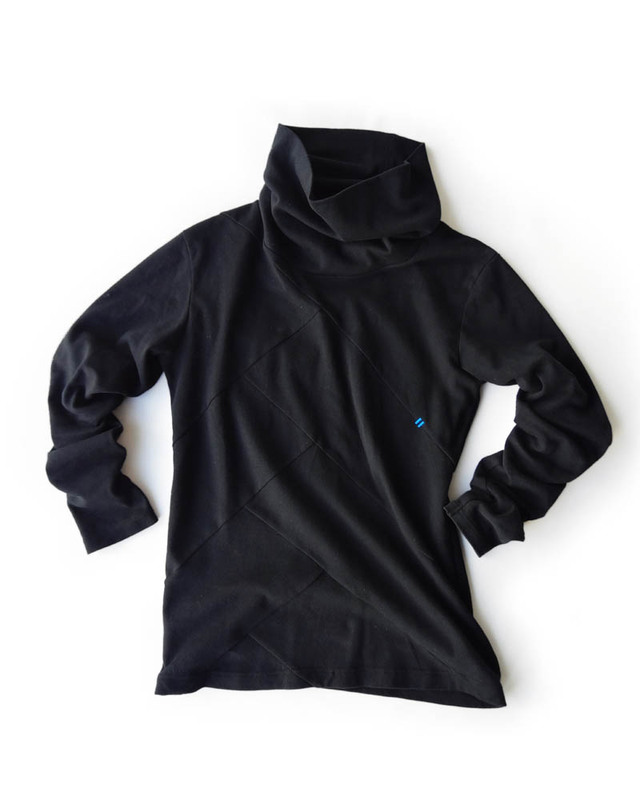 The traditional Sanada-himo strap fixed on the lower waist position is also the new pattern specially designed for this model, and its gray color gradation is giving light and active atmosphere on this tough and duty strap.By coordinating with the same pattern of Slight-sleeve hooded parka, you can wear the water on your whole body. Of course good for exercising or any active use due to its karate-pant function. Out of the elements in “Five Rings” of the esoteric Buddhism thought, the one that signifies change and adaptation is “water”. 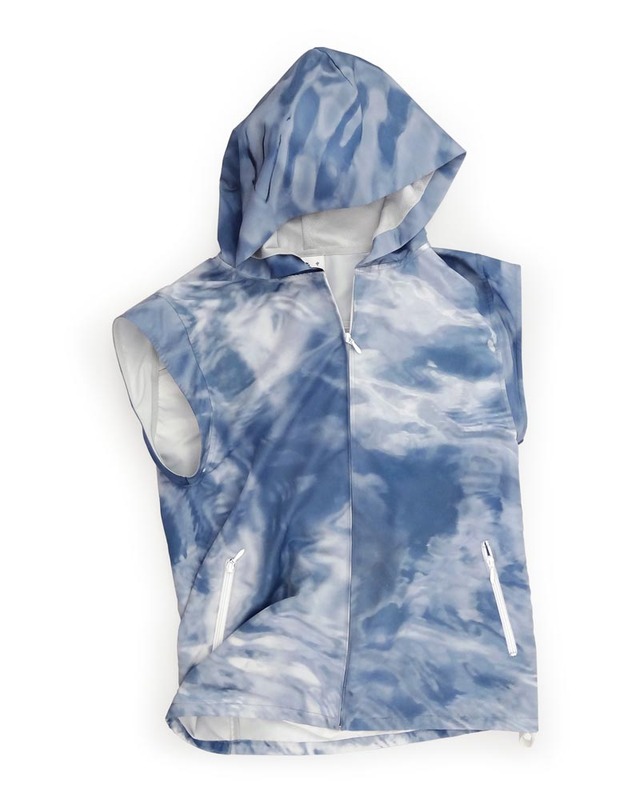 This is the hooded parka designed under the theme, “the wearable water”, made of fine silky polyester on which the original photograph of the water surface is printed. 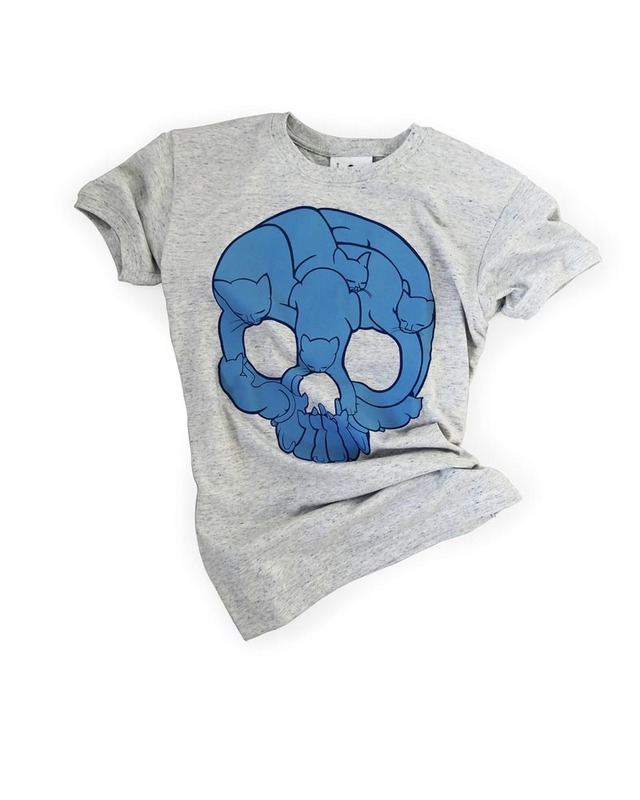 Its silhouette looks a little like a jinbaori, or a samurai coat worn over the armor by warlords. 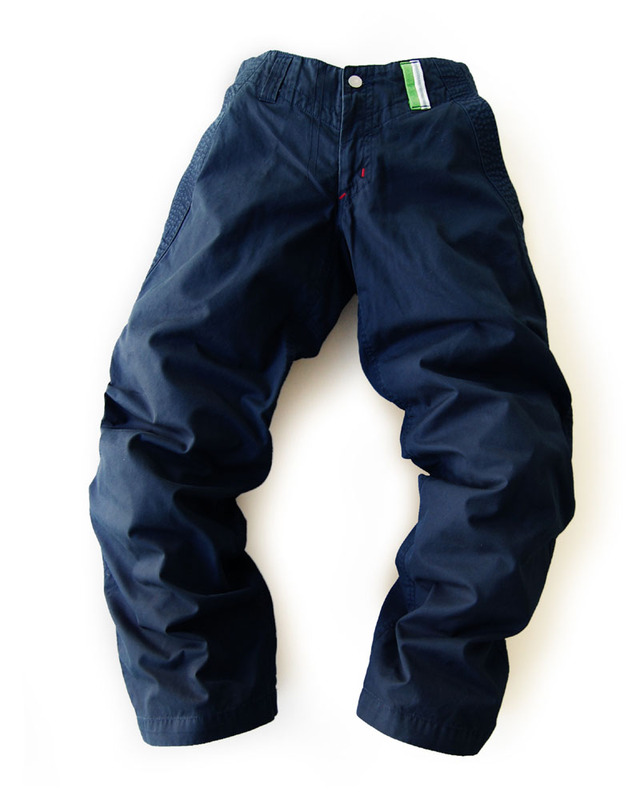 By coordinating with the same pattern of Karate Pants model #9, you can wear the water on your whole body. 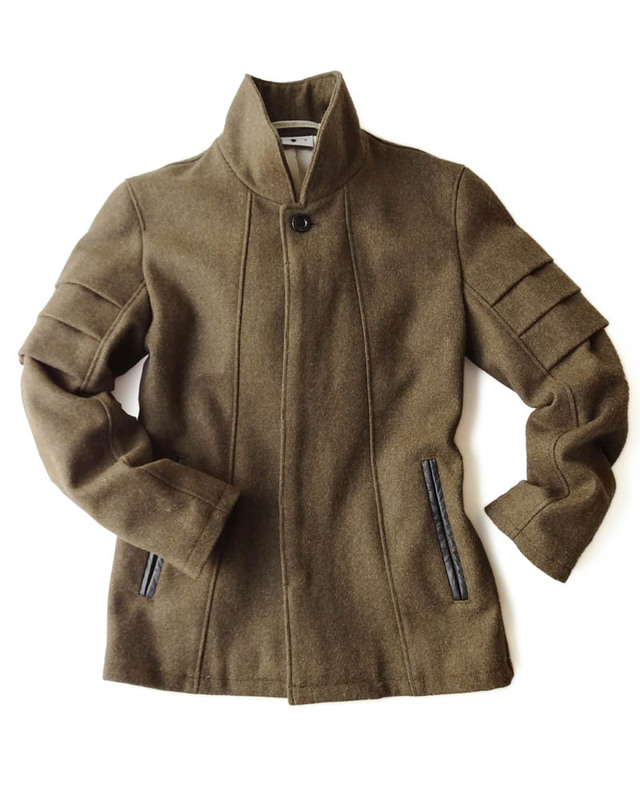 The bottom hem can be adjusted with the inside strap. Good for exercising or any active use. 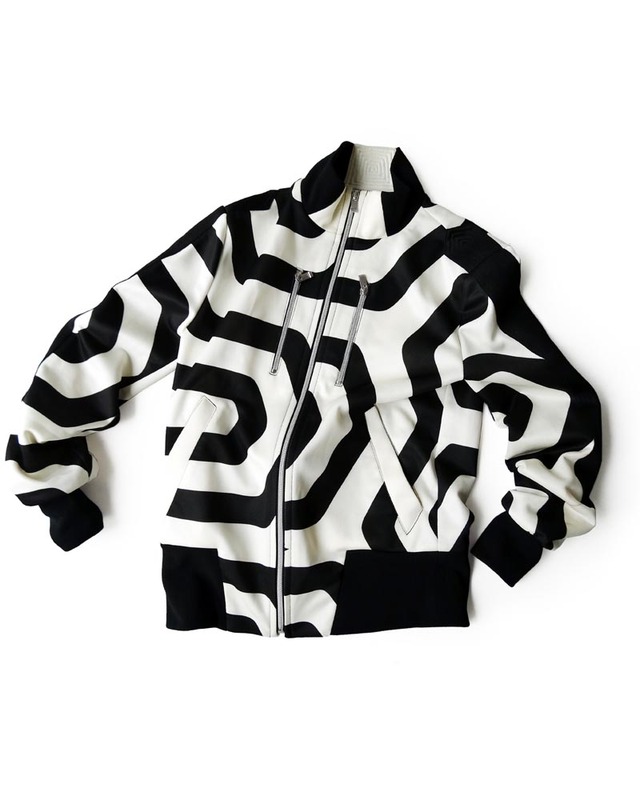 The new version of Yoshiyuki’s low-cut jikatabi, “Flying Heron”, is made of fine kip velour with vivid spring colors. 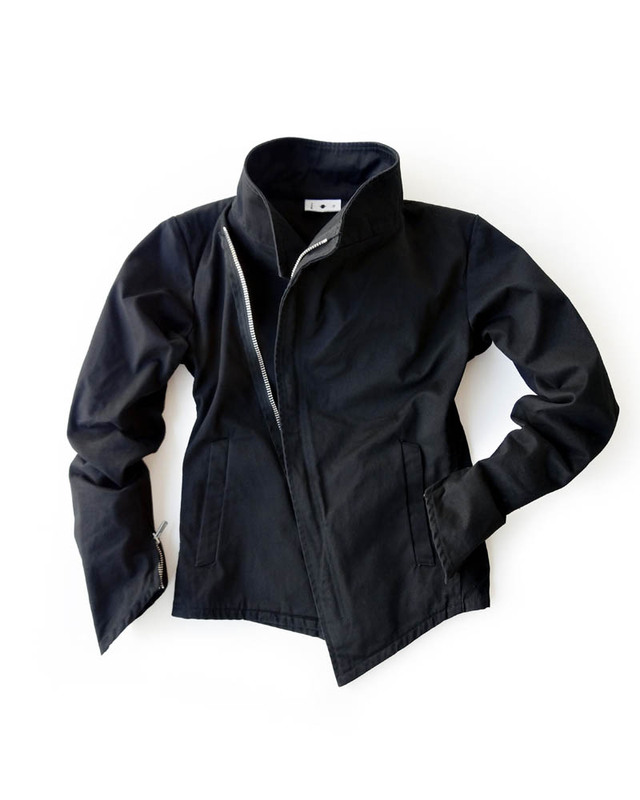 By using the real leather for lining as well, sporty look and elegant fit are combined in harmony. 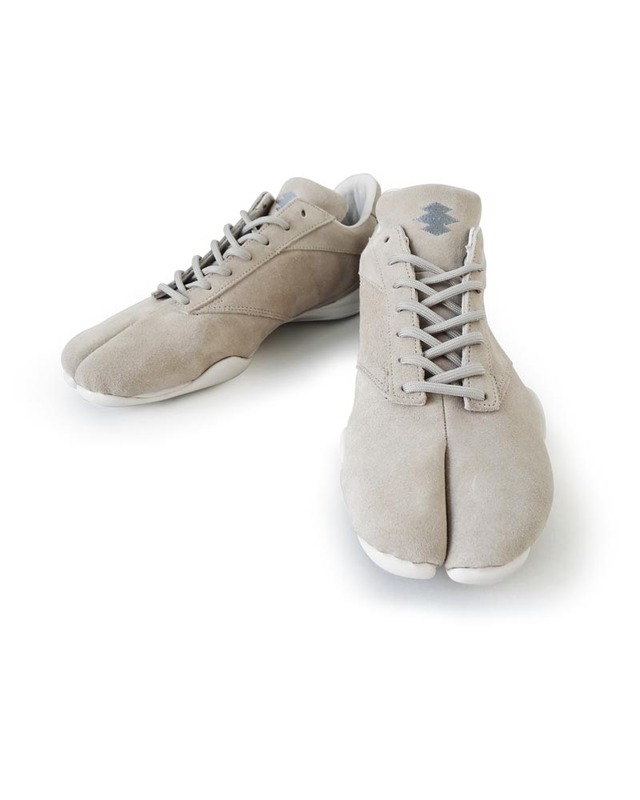 As the name of the model signifies, streamline figure like a flying heron is casted on the total silhouette with the slender plantar arch and the minimum design elements to go with various styles. 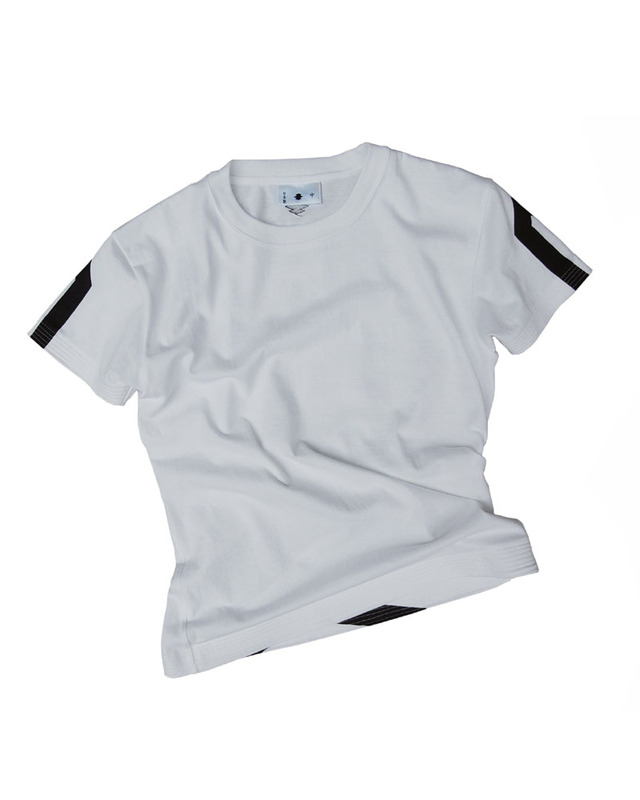 Three quarter sleeve tee made of fine light-weight cotton. Printed kanji characters are each meaning earth, water, fire, wind and void, which are called “five rings” that are thought to be the five essential elments of the universe in the esoteric Buddhism. Also, earth stands for independence and resistance, water for change and adaptation, fire for passion and desire, wind for expansion and freedom, void for emptiness and nihility. The typography is the quotation from the book called “Bushido” written by Inazo NItobe. It says;Bushido as an independent code of ethics may vanish, but its power will not perish from the earth; its schools of martial prowess or civic honour may be demolished, but its light and its glory will long survive their ruins. Like its symbolic flower, after it is blown to the four winds, it will still bless mankind with the perfume with which it will enrich life. 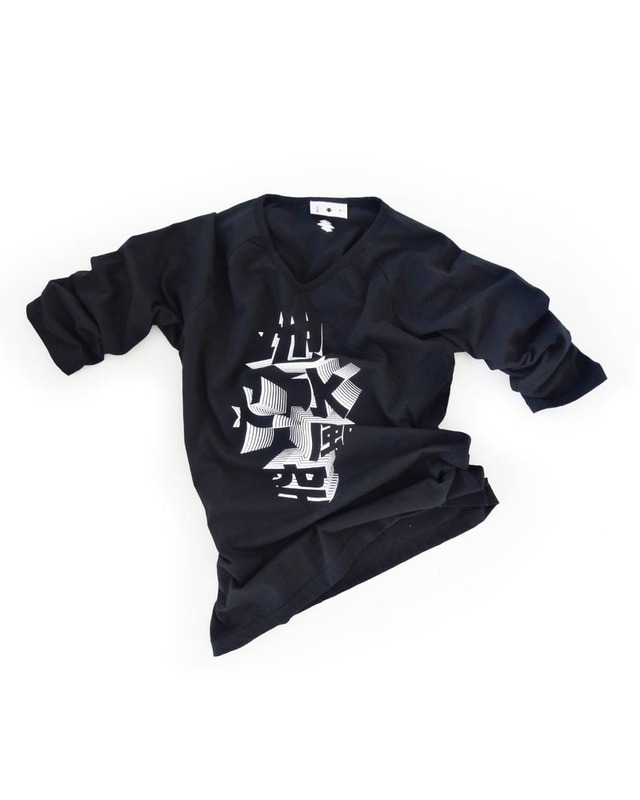 Ages after, when its customaries will have been buried and its very name forgotten, its odours will come floating in the air as from a far-off, unseen hill, “the wayside gaze beyond”The t-shirt body is shaped a little like what’s so called “koiguchi-shirt”, or a unique Japanese loose-sleeve collarless shirt, which is habitually worn in matsuri (traditional Japanese festivals). 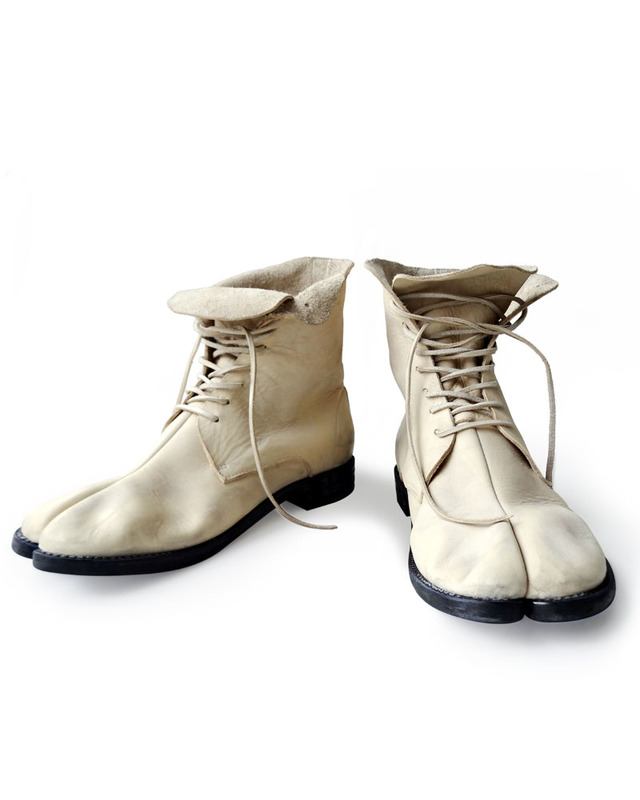 Lace-up boot type jikatabi hand crafted by the skilled shoe-makers running the factory for generations in the old downtown Asakusa, Tokyo. 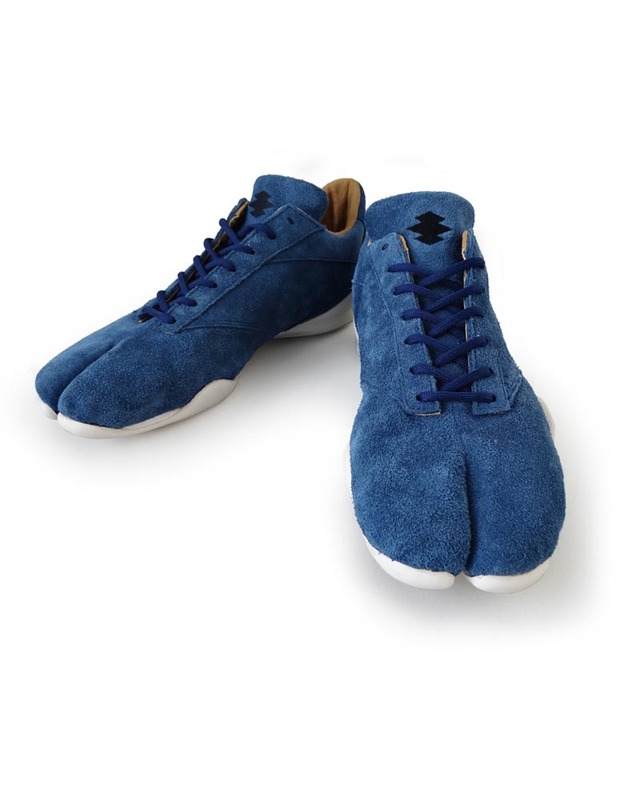 Being made of the fine oil nubuck leather, this model has bulky silhouett and uneven surface like a rock with natural and relaxing appearance like clouds. 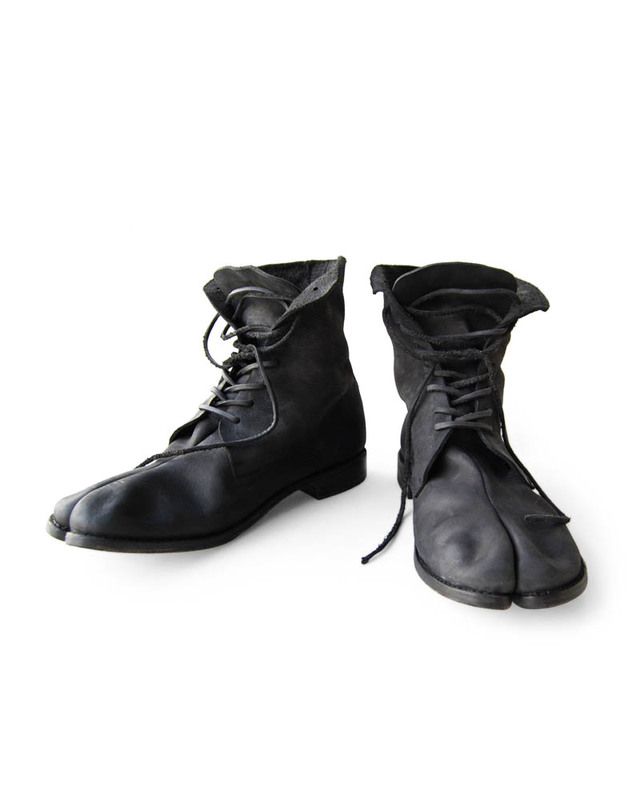 The toe-function of jikatabi and foot-holding system of European boots are nicely merged in balance. 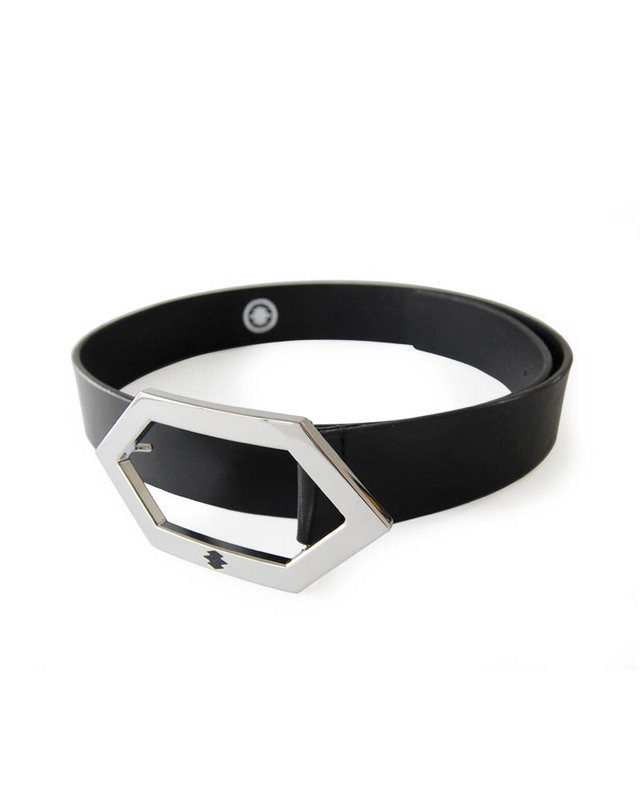 Yoshiyuki’s premier leather belt made of fine 4.5mm-thick leather. 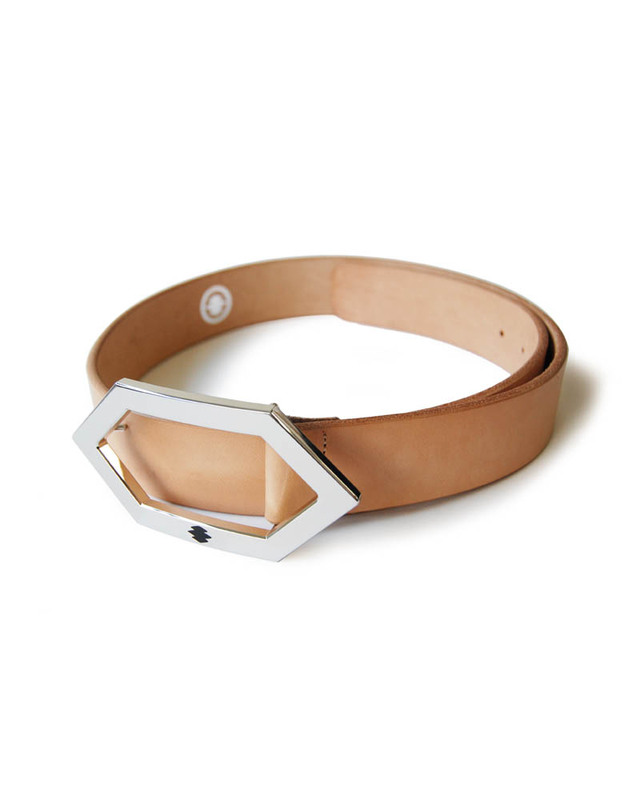 The buckle is not die-casted but using 6mm-thick brass plate punched-out in an “extended turtoise shell crest” shape, which takes more time-consuming work of the skilled craftsmen but can create shaper form with highly attentive finishing. This piece is one and only. 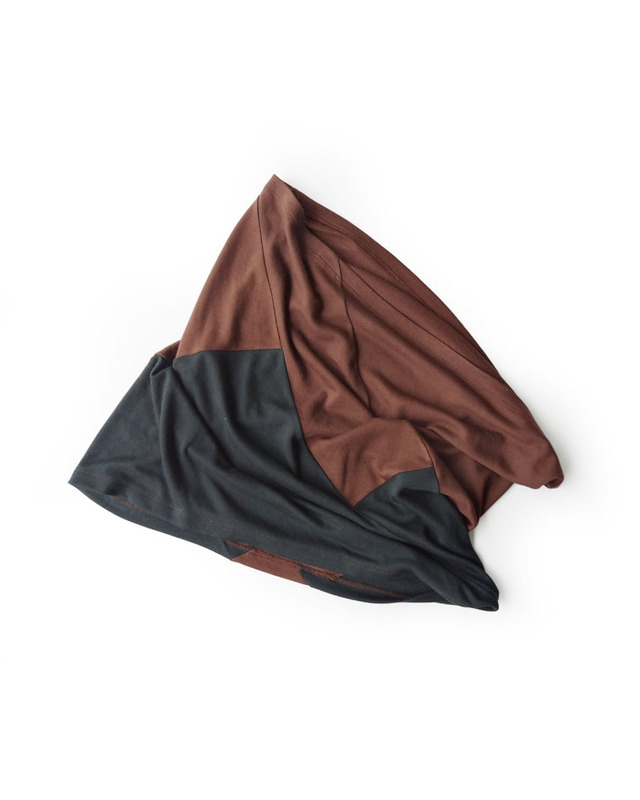 Japanese traditional multi-purpose hand towels made of flat-woven cotton. 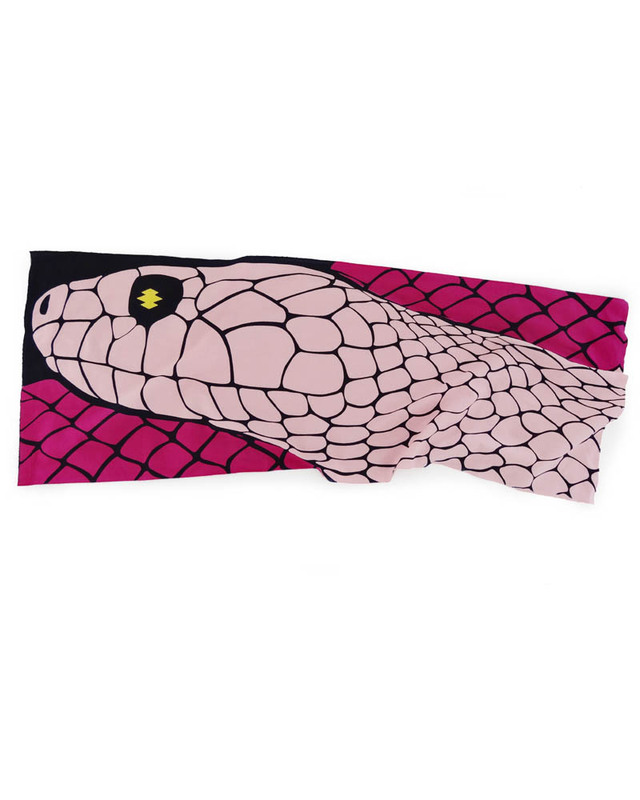 Not only as a handkerchief, it can also be used as wrapping cloth, napkin, bandanna, place mat, wall-decoration art and so forth due to its well-considered size and variety of designs. 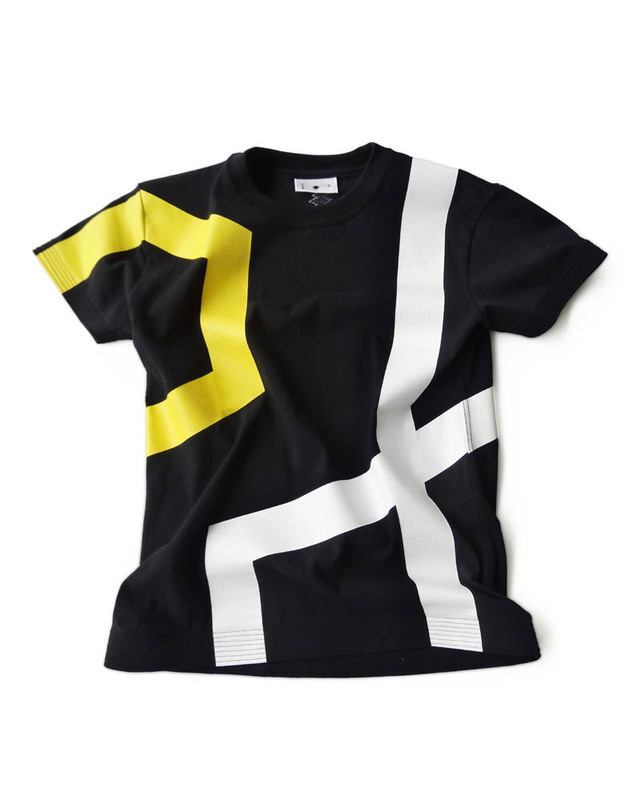 The pattern is dyed with the Japanese traditional dying method called “chusen”, literally meaning “pour dying”, by the hands of highly skilled craftsmen in Tokyo. 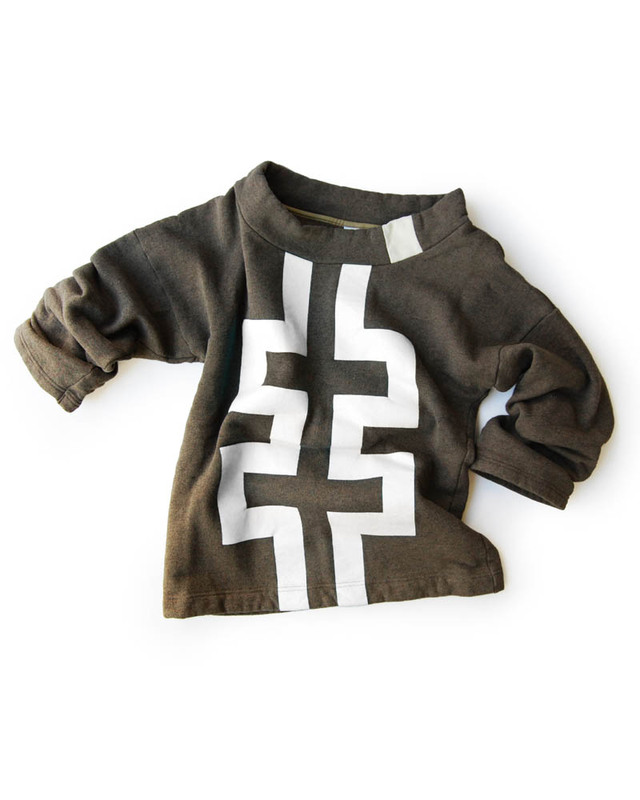 T shirt model #25 “A wooden sword with five rings” In the esoteric Buddhism thought, “Five rings” signifies earth, water, fire, wind and void that are the five essential elments of the universe. Earth stands for independence and resistance, water for change and adaptation, fire for passion and desire, wind for expansion and freedom, void for emptiness and nihility. This philosophical graphic image implies that “budo, often translated as Japanese martial arts, is not only the way of martialism but the way of overall human life. 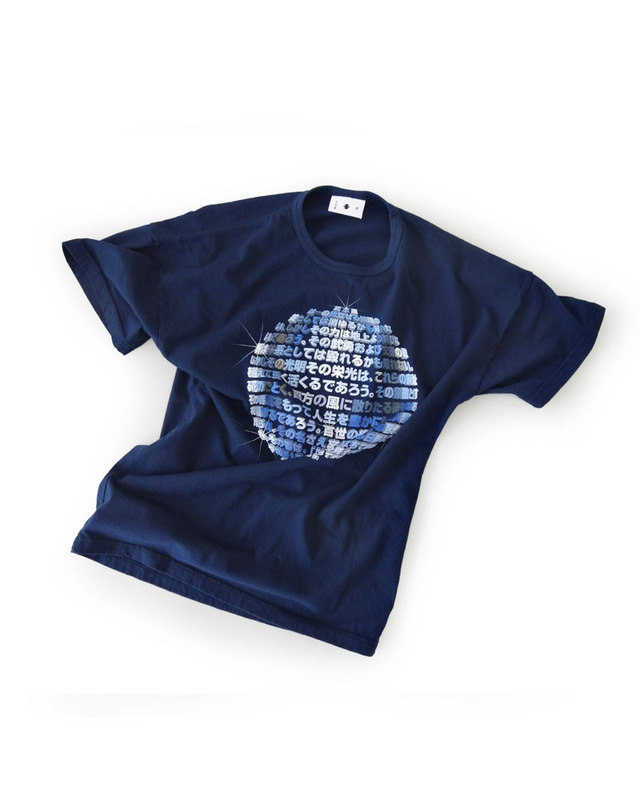 Short-sleeve tee with light-weight cotton fabric. Notare, literally meaning “swell”, is the name of the pattern of a sword blade, which looks just like a calm wave or gently round mountains. 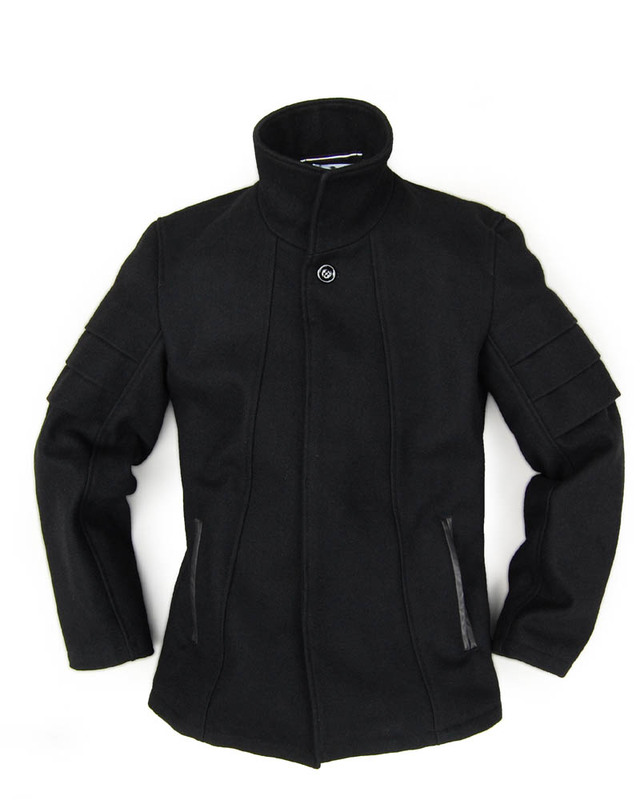 Solid, sharp and tenacious disposition but calm and elegant appearance. It could be one of the ideal states of human beings. 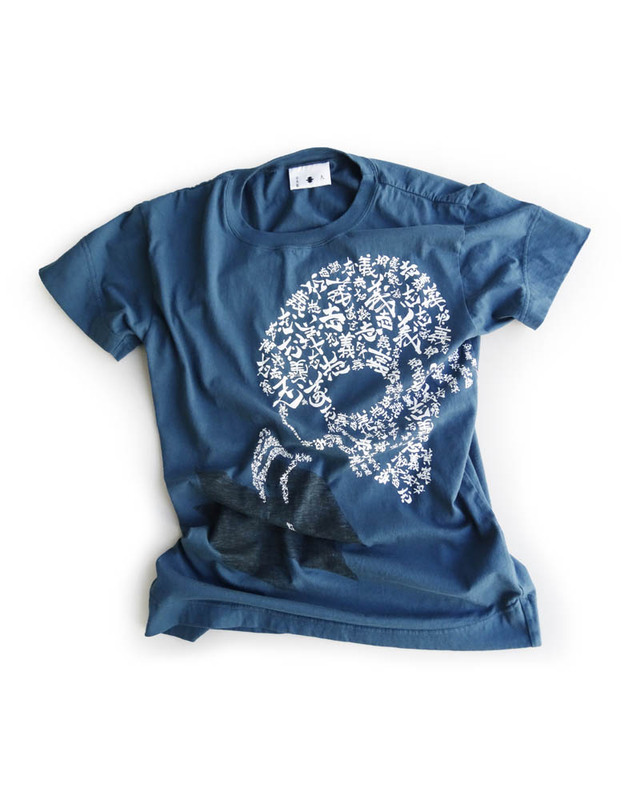 Short-sleeve tee with light-weight organic cotton fabric. The printed image of a group of lovely cats hanging out for seemingly afternoon relaxing casts a totally different image by overall vewing as a whole. The gimmick of such trick art offen called “yose-e” in Japanese, literally meaning arrangement drawing, was also seen in Japanese art scene during Edo era, out of which Kuniyoshi Utagawa was one of the most enthusiastic artists who made this drawing technic common and popular. 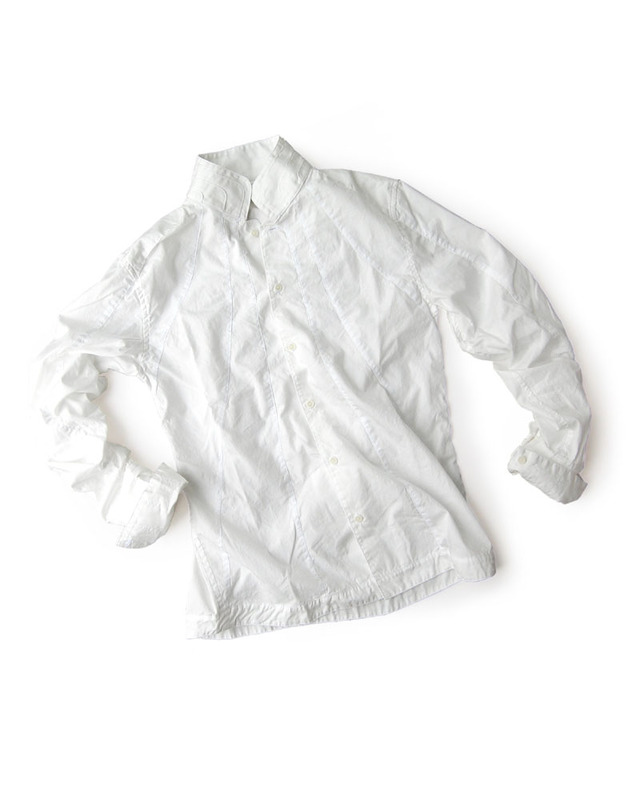 High-collar shirt made of fine Oxford cotton with complex pattern switching. 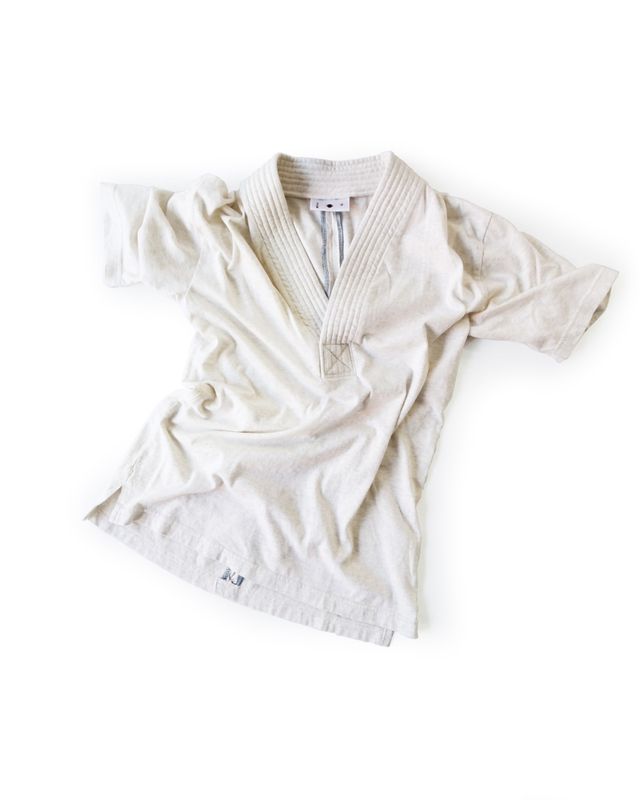 Half-sleeve cotton shirt with the “dogi collar” which is just like the wear (gi) of Japanese traditional martial arts, or budo. 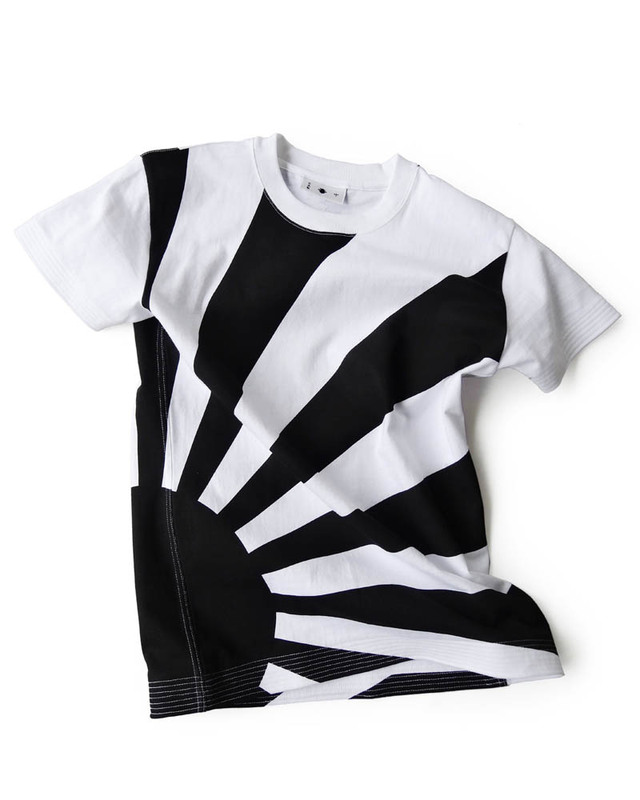 One of Yoshiyuki’s classic shirt inspired by the design elements of old war-period “jimbaori”, or a samurai jacket worn over the armor by warlords. 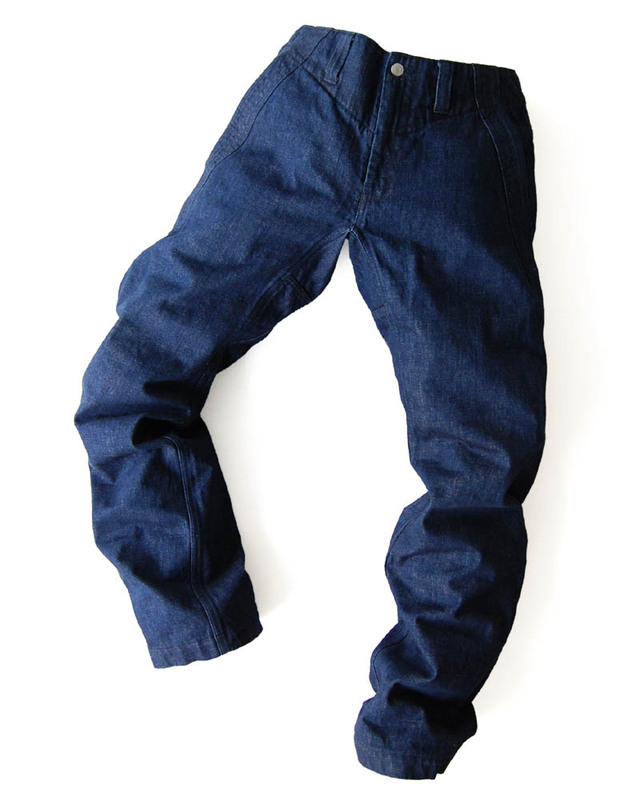 Medium-wide straight pants made of fine Japanese indigo denim woven in Kurashiki prefecture. Beads bracelet of crystal and blue tiger eye made in Kyoto. Comfortable leggings designed for all season. 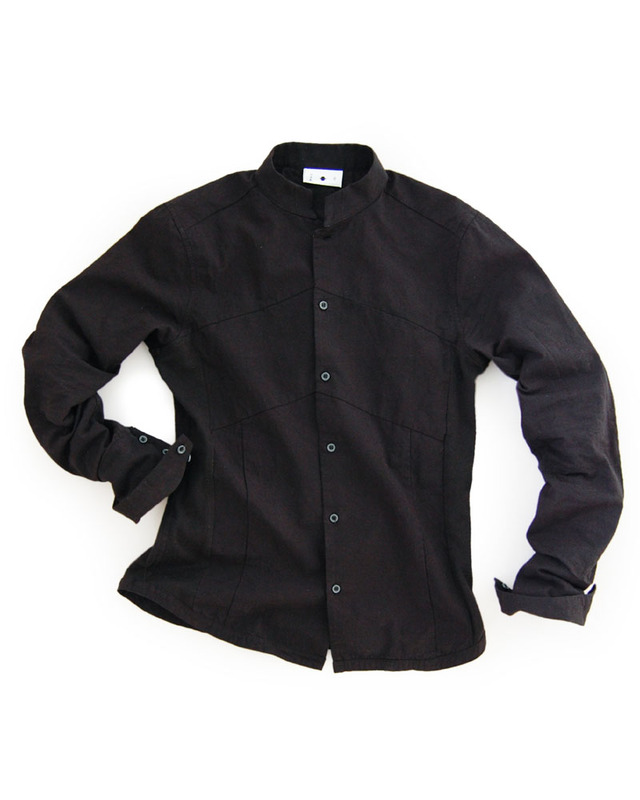 Stand-collar shirt made of hemp mixed cotton fabric with sharp and solid switching pattern. 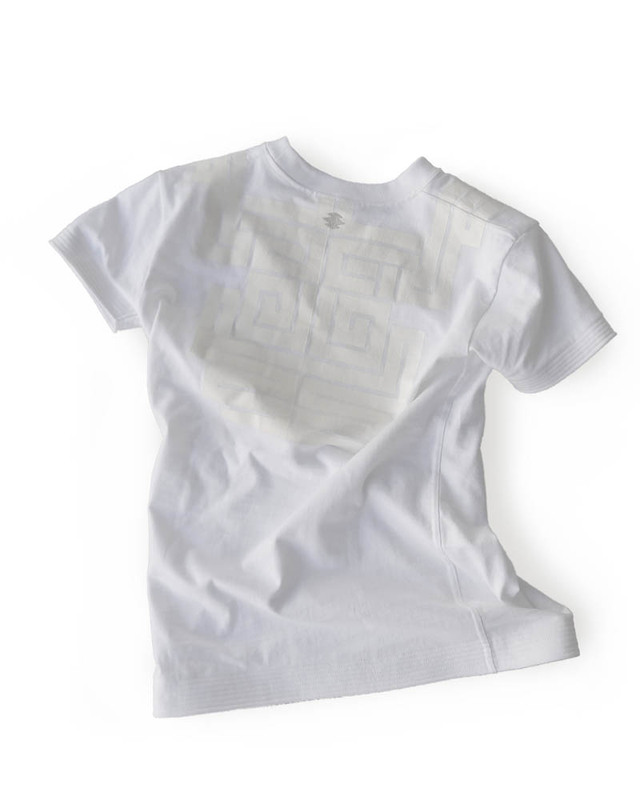 Yoshiyuki’s signature short-sleeve tee with the reinforcement stitches on the hems of sleeves and body. 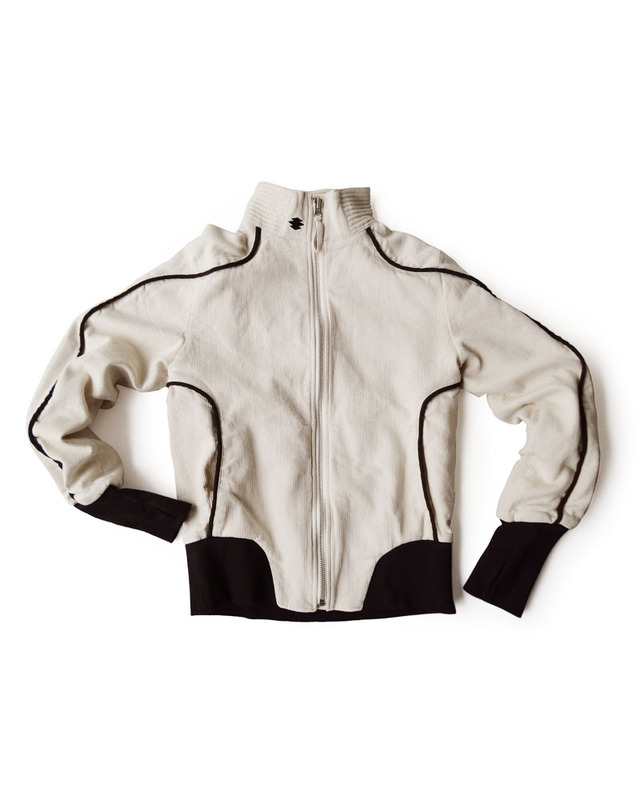 Front zip blouson made of wool mixed cotton with cotton sleek lining. 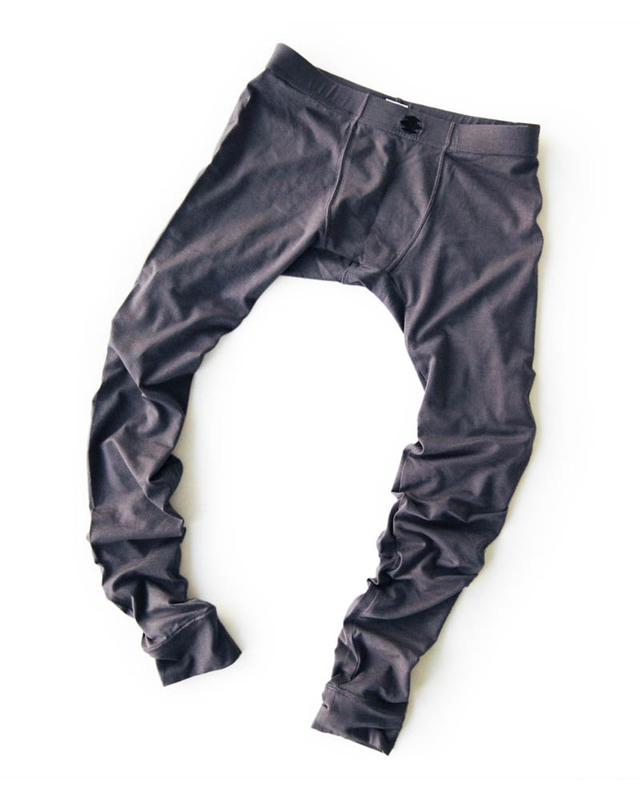 Sarrouel-like long rise pants made of thick and fine moleskin cotton with edgy and solid pockts. 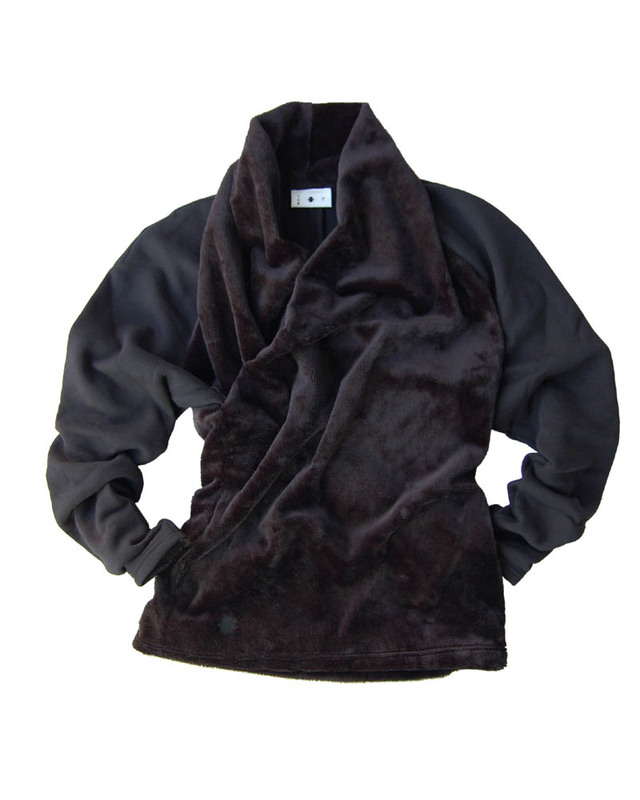 Big and wide tube type neck warmer made of very soft acrylic and poliester fabric. 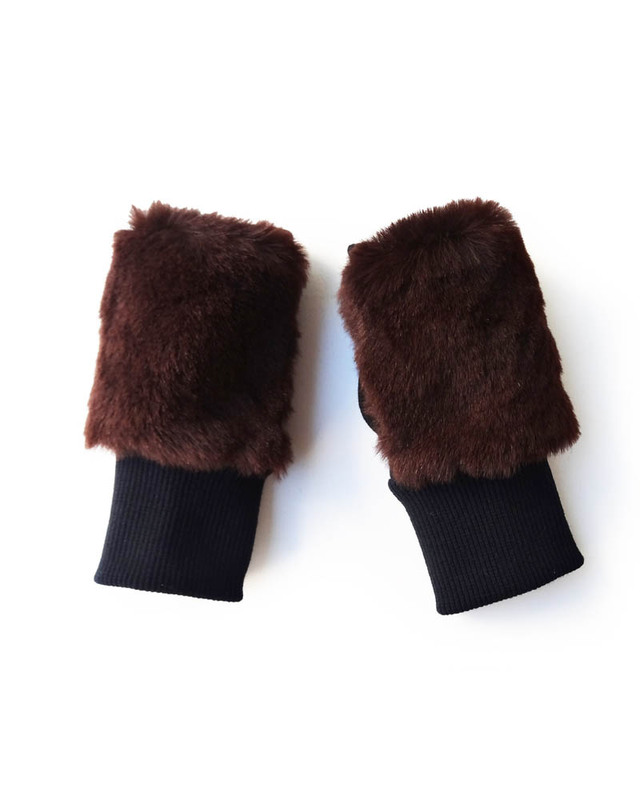 Free finger gloves made of sheep fur combined with cotton sweat fabric on the palm side. 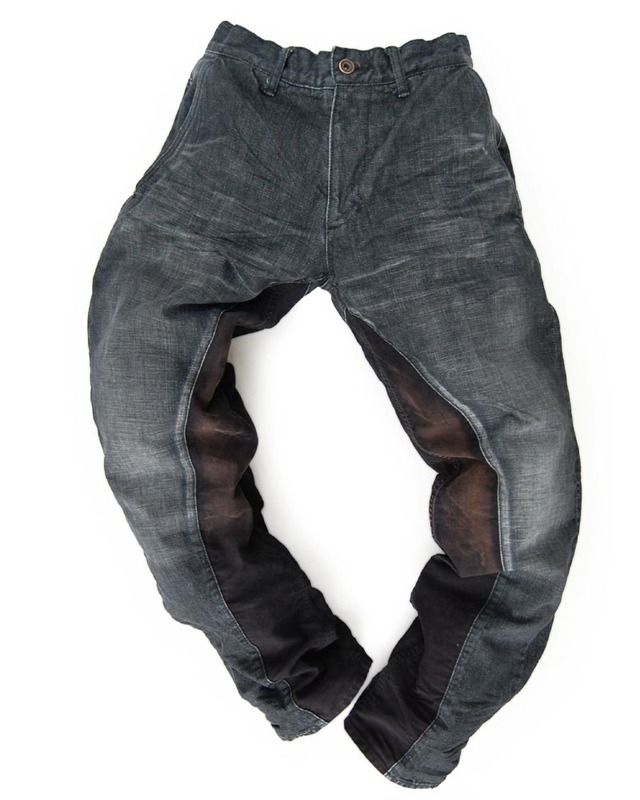 Curved loose black-denim pants switched with fine cotton moleskin. 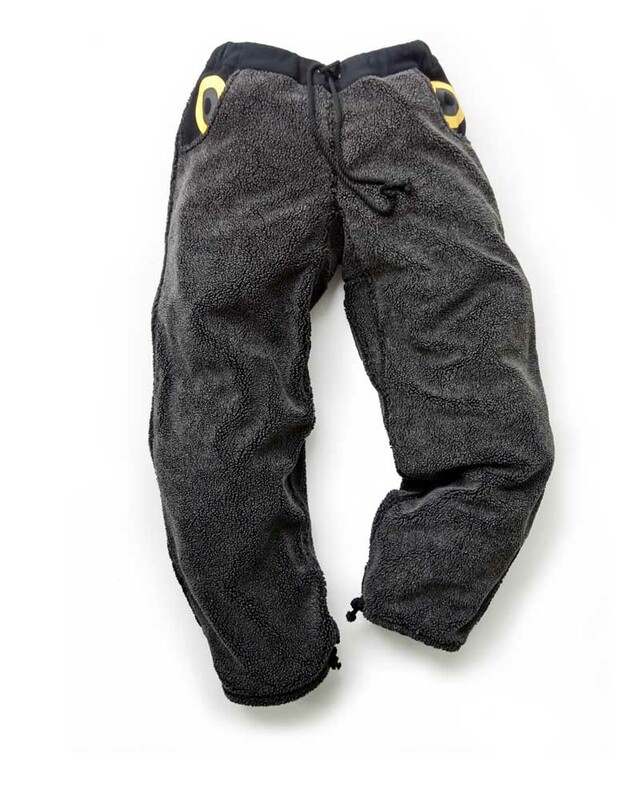 Easy wide pants with elastic waist, made of artificial boa. 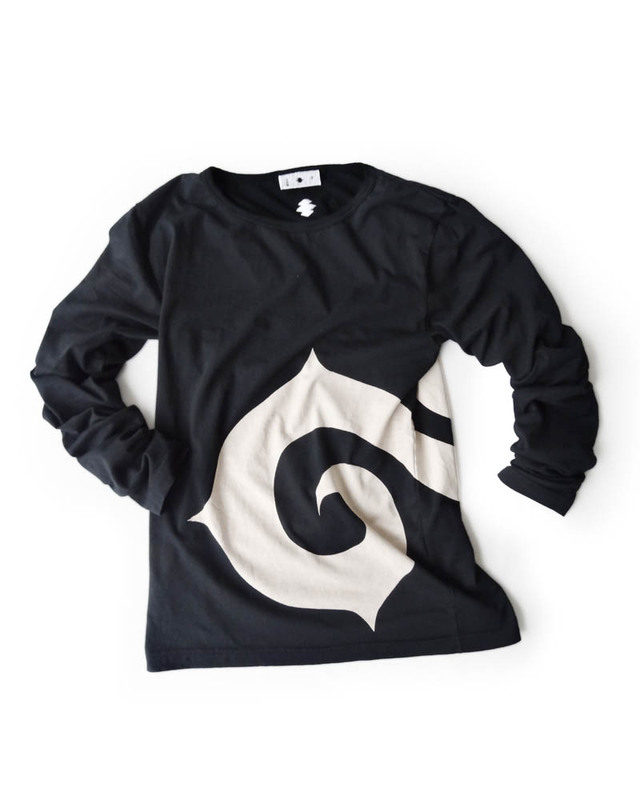 Long-sleeve tee with light-weight cotton fabric. 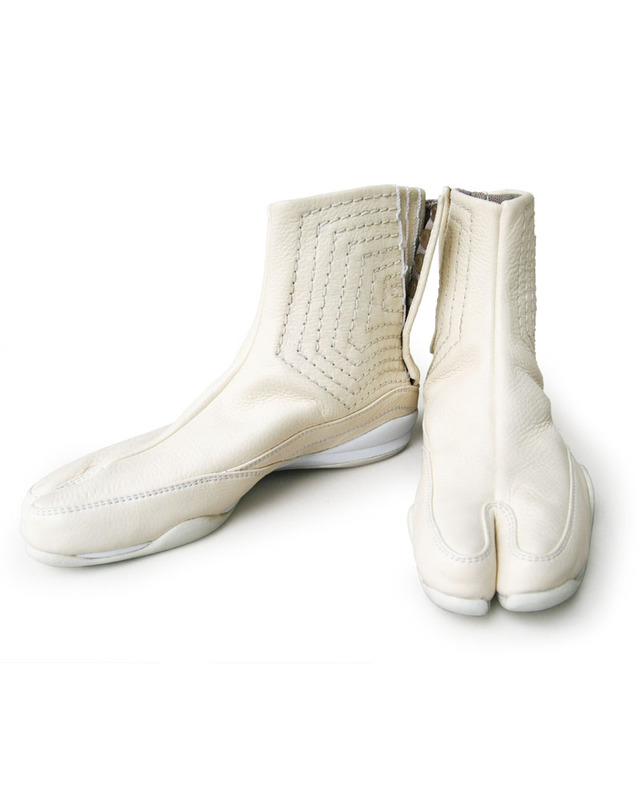 Semi-high cut jikatabi (split-toe shoes) made of fine leather with Yoshiyuki’s oroginal athletic soles. 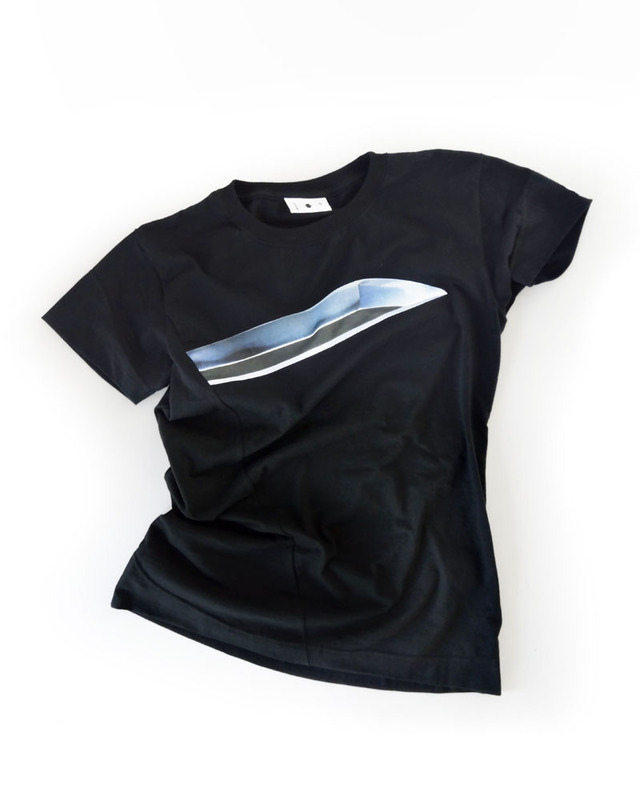 Short-sleeve tee with light-weight cotton fabric. 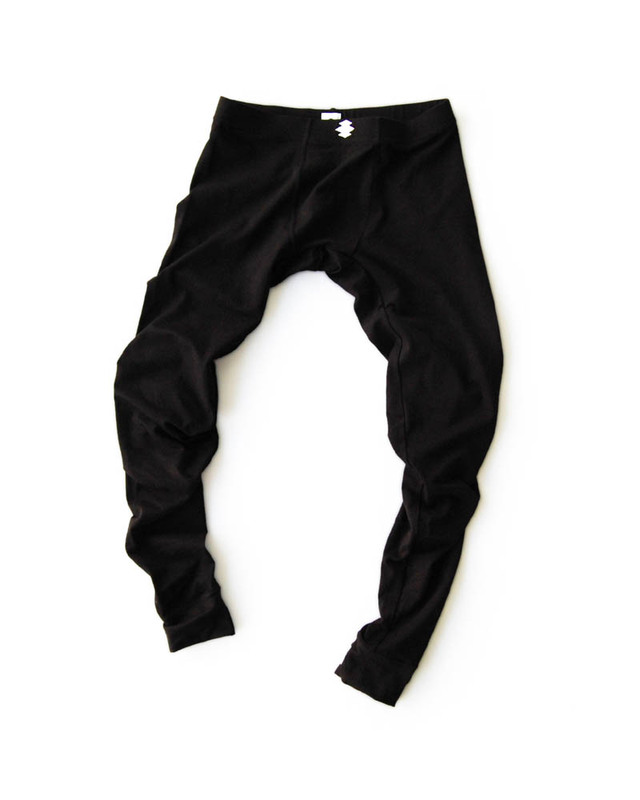 Curved loose black-denim pants switched with fine cotton moleskin. Uneven pentagon shaped back pockets and the accent of Japanese “sashiko” fabric on one of them are the trade mark. 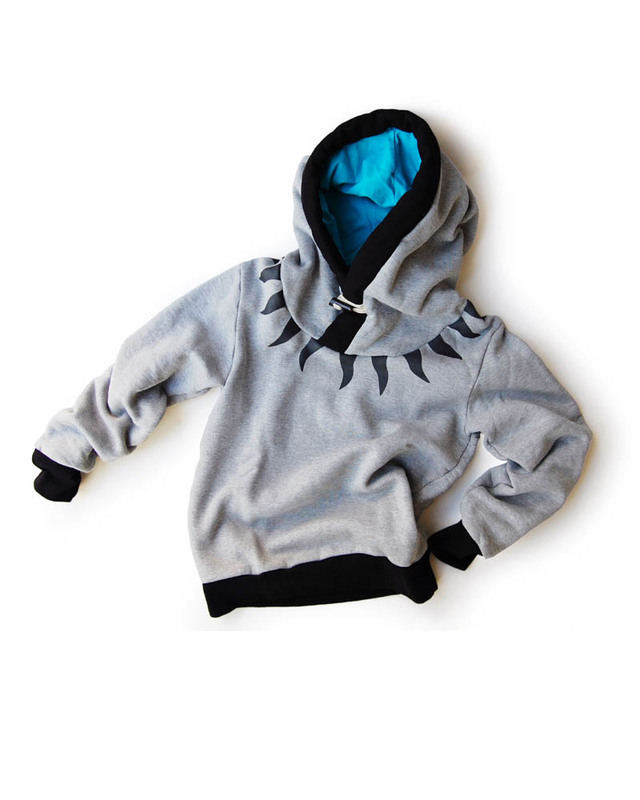 Yoshiyuki’s signature front zip parka with its unique slant-eye pockets and mask hood. 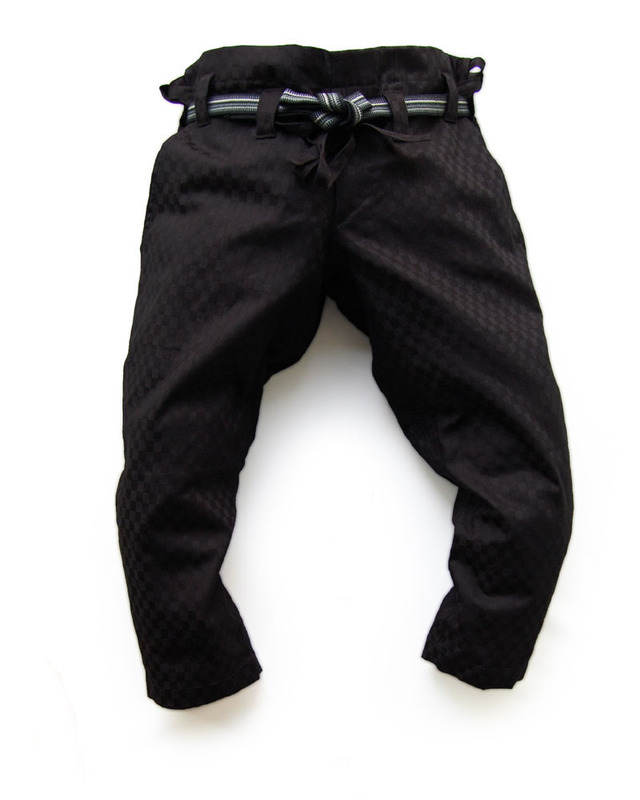 Cropped slim karate pants made of fine satin cotton fabric woven into Japanese Ichimatsu check patten.